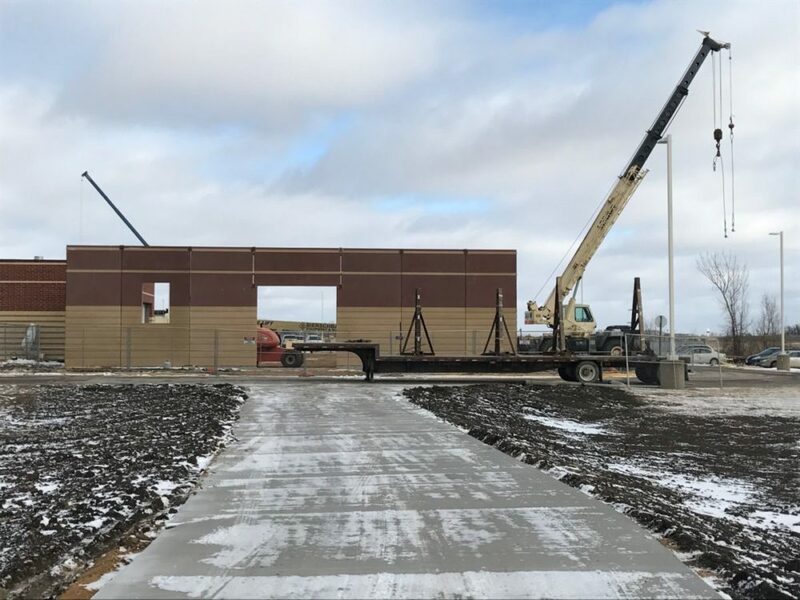 Since 1994, Brennan Construction has been constructing quality buildings on time and within budget throughout Southern Minnesota. By effectively providing design/build, general contracting and construction management services for a variety of markets including commercial, retail, institutional and industrial, we have established thriving relationships with satisfied clients and strategic, solution-oriented partnerships with key professionals and tradesmen. It is our unwavering commitment to our clients, the strength of great partnerships and our philosophy of building structures for success, prosperity and preservation that ensures client satisfaction—our measurement of success. 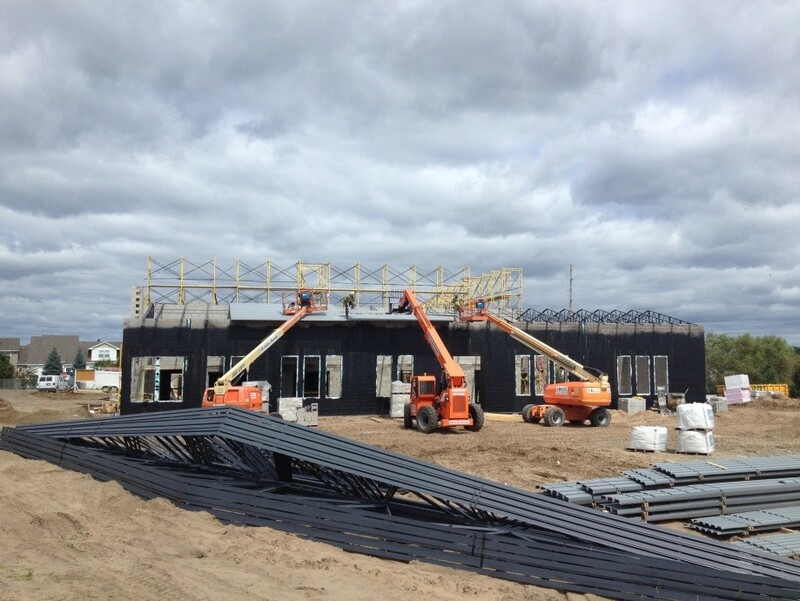 Brennan Construction is a Targeted Group Business with the State of Minnesota. 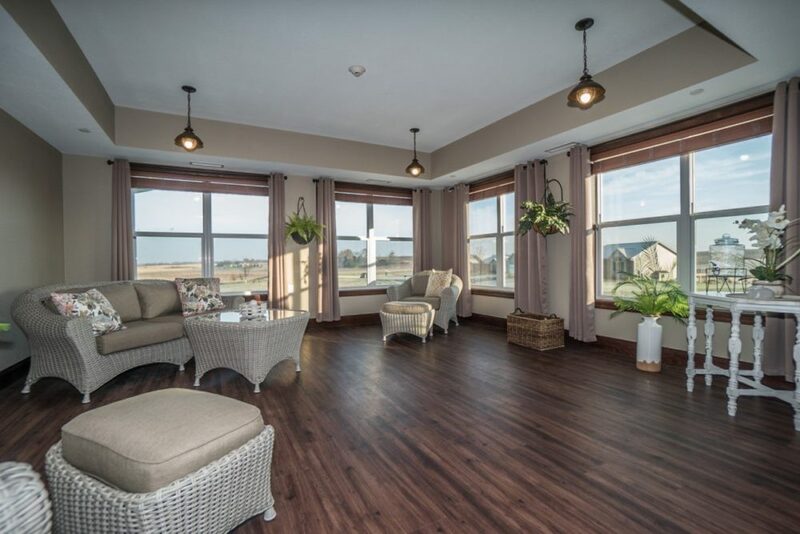 By providing construction management services, Brennan Construction has obtained optimum flexibility, quality and value for their clients on a wide variety of building types. Through advisement and total coordination of design/construction services to owner group reporting, the seamless responsibility of having us manage the project is efficient and effective. Our knowledgeable team takes this responsibility very seriously and works tirelessly to inspire and provide premier construction skills and services that not only measures up to but exceed our client’s expectations. The design/build method keeps one point of contact for our client. This allows our clients to save time and money by having the designers, engineers and construction personnel working closely together and communicating effectively throughout every stage of the project. Having Brennan Construction involved from the onset of project planning can save you time and money. In a ground up construction project, we go to work identifying and planning the appropriate building materials, engineering systems, construction methods and estimates/schedules that will bring your vision to reality on time and within budget. By providing open lines of communication, expertise knowledge and effective solutions to construction issues before they arrive on site, we can eliminate time-consuming and costly-changes throughout the construction process. At Brennan Construction we are dedicated to helping our clients maximize their investment through each step of construction. Through the process of value engineering, we identify and develop solutions that will bring increased value to their buildings. With the goal of maximizing performance and minimizing costs, we carefully examine various construction methods, materials and systems to determine the best possible alternatives for each individual structure. The construction, operational and maintenance cost savings identified through this process results in a structure that performs, saves and builds value for its owners. With our value engineering comes discussions of future plans as well. We help you plan for the future by selecting designs and features that are timeless, functional and will serve our clients for a long time. At Brennan Construction, we’re committed to your success. From the start of the vision process through project close-out, as general contractor we go to work scheduling, managing and contracting all aspects of the project ensuring that your project is completed on-time and to your satisfaction. We know you love your existing location but that it needs to work better for you. We will work to renovate your space so that it is practical and meets your needs. By selecting and partnering with the right subcontractors, suppliers and vendors, we bring unequaled responsiveness and valuable solutions to each and every project no matter how large or small. The leadership we provide as general contractor keeps each project on track and within budget resulting in quality execution and ultimately your success. We’re committed to making your space work for you. Over the years we have built out fitness centers, banks, restaurants and office space for realtors, lawyers and financial planners. Our team works to get your business up and running in your new location that will be functional and efficient for your business. 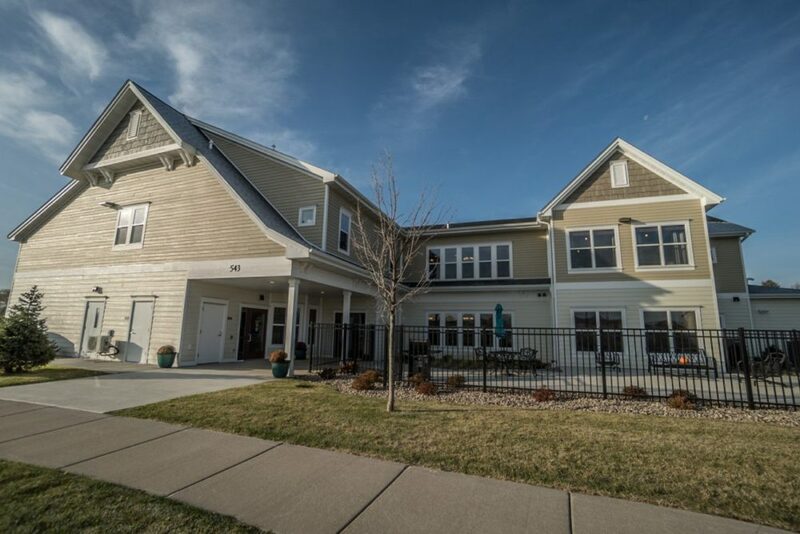 Brennan Construction built Breckenridge Townhomes in Eagle Lake for the Blue Earth County Economic Development Authority (EDA). The Blue Earth County EDA is very pleased with the quality project and the construction process. Work continued on time, minor issues were dealt with quickly. Now fully occupied, the tenants are very pleased with their new homes! I recently served as Chairman of the Building Remodel Committee for our church, Centenary United Methodist Church of Mankato, MN. Having worked in the commercial construction industry for the last 19 years, I have experience working with many local and regional General Contractor’s. Over the duration of our project I spent countless hours working with Mike Brennan regarding the details of our project. During this time it became evident that Brennan Construction was dedicated to our project and our staff. Brennan Construction exhibited quality craftsmanship in the construction of our building, but more importantly the Brennan Construction personnel went above and beyond the project scope to make sure our staff was clean and comfortable at a time when our building looked like a disaster area. Our congregation had very little clue that major construction was happening because of the efforts of Brennan Construction to clean the areas used for worship each Friday. I’m happy to report that our project was completed on-time and within 1% of the proposed budget. We have the highest respect for the difficult job that they performed and highly recommend Brennan Construction for any commercial construction project. Brennan Companies completed several remodel projects at our Intergovernmental Center. Communication was on point, project budgets were met, and the projects came to a successful completion. We have known and worked with Brennan Companies for several years. The work they have done has been for schools and colleges throughout the State of Minnesota. It has been our experience that Brennan Companies has the skills, knowledge, equipment, and trained manpower, along with the financial ability to be awarded projects and contracts to perform these services. They have been involved in numerous MnSCU projects at various college campuses. They are also aware of the MnSCU design standards and pay strict attention to ensuring the proper detailing. We would recommend Brennan Companies due to their abilities to effectively manage these projects to ensure that they are completed successfully. One of my primary concerns during the construction process was to the nursing home residents living in the ‘construction zone’ as well as the employees who needed to work there. The construction workers were respectful to the elderly clientele and maintained a safe environment for themselves and those around them. . . . The workers were gentle and respectful in their interactions and it reinforced to me that we had selected a contractor with similar values to those that drive our company and services. The timeline of the entire project was driven by a deadline for one-time discretionary federal/state funds, resulting in condensed design, bidding, and construction schedules. . . . Brennan Construction was accommodating to this process and worked with us to have as little disruption to our provision of services as possible. I am ecstatic with the end results of the project. . . . Together we have built a building that will provide a home to our parents, family, friends, and neighbors. Thank you for leaving your mark on this community. We have been fortunate to work with Mike Brennan and his crew on several projects, dating as far back as 2001. Their professionalism and integrity is outstanding. Mr. Brennan is a gifted GC who takes great care in making sure that the owners’ interests are protected while striving to complete the project on time and within budget. 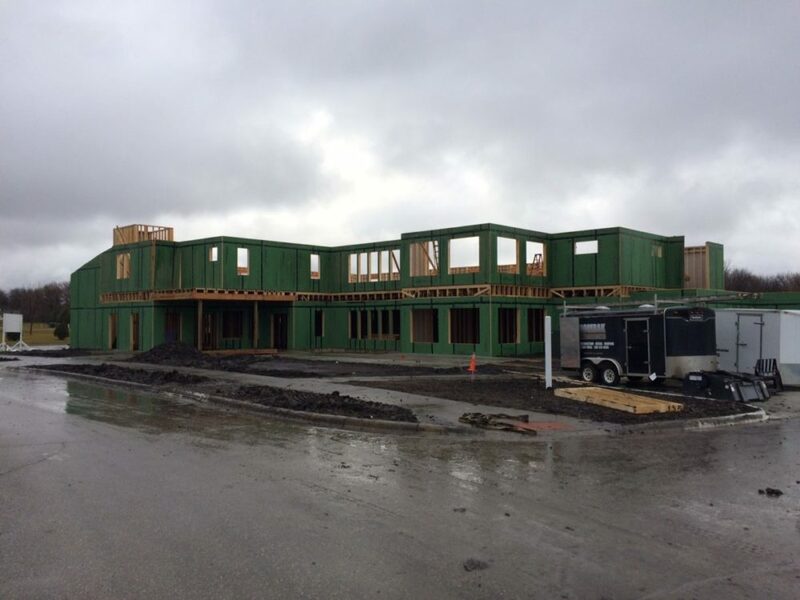 Throughout the course of each project, Brennan Construction, Inc. is safety conscious and is absolutely clear in their record keeping. Mr. Brennan chooses and manages his subcontractors well. He creates a team atmosphere with his subcontractors. He is able to make each individual worker feel respected and appreciated. Throughout the projects, Brennan Construction consistently shows their excellence in coordination, cooperation and teamwork. In doing so, this makes the projects flow much easier for all involved. We at Mechanical Resources, Inc. are proud to have built a positive rapport with Brennan Construction, Inc. and look forward to working with him in the future. Brennan Construction completed our project within the scheduled timeline as well as within the planned cost. Throughout this project, the Brennan Construction team did an excellent job in communicating as well as coming up with innovative solutions. I would recommend Brennan to anyone who is looking at doing a time sensitive and complex project. 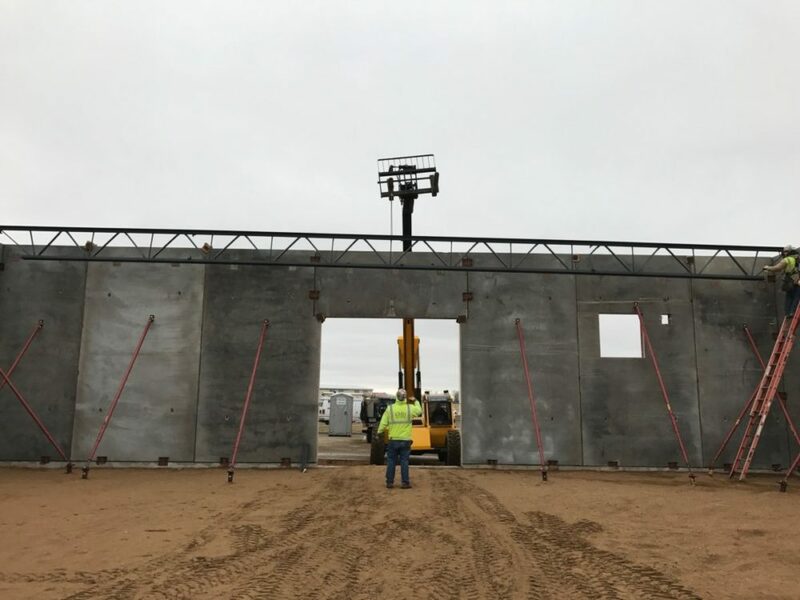 Brennan Construction showed great construction and project management skills when constructing the new precast fire hall project for Morristown, MN. Truly a pleasure to work with this team. During the construction phase of our church, Mike Brennan and his crew performed quality work in a timely manner. Mike Brennan and his site foreman held and attended weekly meetings with the church building committee to keep us apprised of the progress of construction. We found Mr. Brennan to be fiscally responsible during this process and he was willing to be flexible in minor changes to the construction plans. We would highly recommend Brennan Constriction Company for the construction of your project. We would hire Brennan Construction for any future building projects, should the opportunity arise. “As Executive Director for a nonprofit, renovating a building built in the 1800s was a rather unique project – and not one in which I’ve had a lot of experience. However, I had the good fortune of working with the Brennan team throughout the process. I appreciated our weekly update meetings in which we toured the project. I also appreciated their close scrutiny of the budget – something that was critical to our organization since repairs and renovations were being funded with contributions from our generous donors. I also appreciated their willingness to seek me out, when necessary, for my input regarding various decisions hroughout the process. This building very much became a team effort between Brennan Companies and our organization. Because of our very open line of communication, we had relatively few surprises throughout the process. Having known and worked with Mike (Brennan) for many years, I’ve seen many examples of Mike’s strong leadership skills – from the projects he works on professionally to his position as Associate Teaching Director of the Community Bible Study, he believes in giving his best. We’re working together on the Marigold project in North Mankato and have a shared enthusiasm for what the development of this site will bring to the City Center. He’s set high standards for excellence on-site and has kept the project moving despite potential delays. He showed strong leadership recently, having to terminate a subcontractor for not complying with these high standards. Mike also has shown his depth of experience and insight by identifying ways to cut costs while maintaining efficiency and without sacrificing quality. Brennan Construction was selected as our contractor for our project at Sleepy Eye Medical Center. I had never had the opportunity to work with them before so I was not sure what to expect. From the beginning I have been impressed with their organization. Their work has always been professional and they have adhered to our expectations related to performing construction work in a healthcare facility, which can be difficult. Their staff has been fantastic to work with on a daily basis. We communicate on a regular basis and their responses to our concerns have always been timely. I would recommend them to anyone considering a construction project in their facility. We have had the pleasure to work with Brennan Companies on a number of projects, most recently the construction of our own office building. Brennan Companies staff were prompt, professional and responsive to our needs. The realistic nature of these projects is that plans change, walls move & budgets get adjusted. Brennan stayed with us through each step, kept our team on track and successfully delivered a fantastic new 11,000 SF office space for our firm. What a pleasure to work and interact with Brennan in this space! I have the pleasure of not only designing [our new office space] but also working in the space following construction. I sincerely appreciate the exemplary manner in which Brennan Companies performed on the project, from the preliminary estimates and value engineering to final completion and closeout. The problem solving abilities of Mike [Brennan] and Kelly [Sandborg] and their attention to detail and finish quality made the construction phase a very satisfying experience. I have been working with general contractors on a daily basis for the past 20 years. I have appreciated working with a company that understands and is dedicated to the ‘team’ approach. We as owners incorporated not only our own consultants but construction materials as well. Mike and Kelly communicated to the entire team to make sure the construction process was efficient and economical. They took special care to ensure that the finished building meets or exceeds all of our expectations. It is with great privilege to write this letter of recommendation for Brennan Construction. From the onset it was a pleasure to work with such a professional and detail oriented group at Brennan Construction. Our EI Microcircuits building project was under a very strict build schedule, which your group not only took on the challenge but met our deadline, while not compromising quality in any aspect of the building process. Throughout the project you consistently showed excellence in coordination, cooperation and teamwork. As a principal, lead architect and interior designer with I&S Group from 2003 through 2012, it was always in our clients’ best interest–as well as our own–to work with developers and builders that understood a true team concept in terms of project approach, along with an appreciation that we both worked for the same owner; Mike Brennan and his crew exemplified that on each and every project we worked on together. Over the course of this time, I began to see that customer satisfaction was something that Brennan Companies established as a very high standard for themselves, and not only because they had to for others. A positive, pleasant attitude of “we can do that!” is something that pervades their entire organization. As a commercial architect of over thirty-four years, I cannot express enough the pleasure and successes that derive from that kind of attitude and spirit. Through work at I&S Group, as well as social and civic involvements with Mike and Cathy Brennan, I learned more about them, their values and business-like approach to projects, whether they were for public, private or for non-profit organizations. These people take a vested interest in their projects and the relationships they form with people and the communities in which they are involved. Kato Cable had a very aggressive construction schedule. We had to be in the building and manufacturing product on November 1st, leaving less than three months for the total construction period. Brennan Construction achieved this goal with flying colors. In spite of the aggressive schedule, we were still able to collectively make several modifications and enhancements to the building giving us a show piece manufacturing facility. Brennan Construction made this a truly exciting and enjoyable experience. Our company has worked with Brennan Construction for over a decade on more than 75 projects. During that time we have always found the entire Brennan Construction staff to be very professional to work with. Brennan Construction is adept at working with customers and subcontractors on projects that are strictly specified as well as projects that are set up on fast track design and build schedules. Brennan Construction communicates well with its subcontractors and from our perspective balances their responsibility to keep their customer’s needs and interest first with their subcontractors need for direction and organization of projects. I would highly recommend Brennan Construction to any customer planning a commercial construction project. 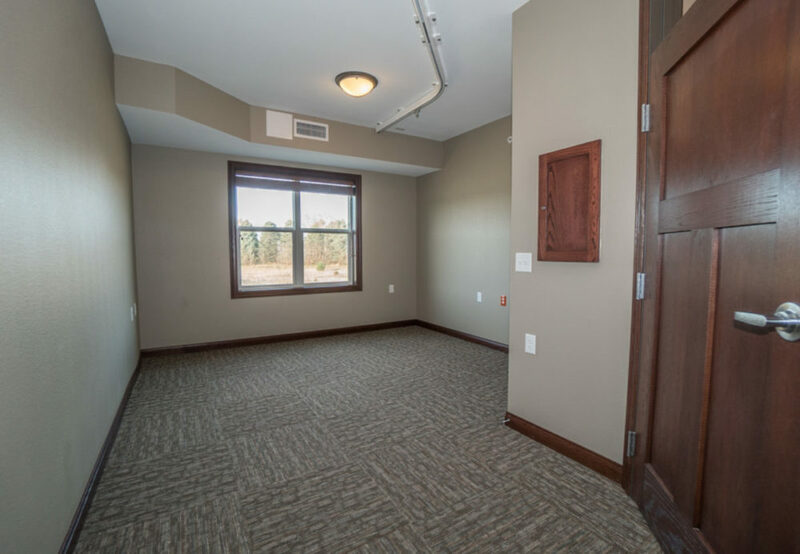 Restoration of the Landkamer Building and the development and build- out of our new office space required a leap of faith by both Gislason & Hunter, and Brennan Companies. The project began with what could be called a good old fashioned hand shake, and the details were actually hammered out during the construction process. 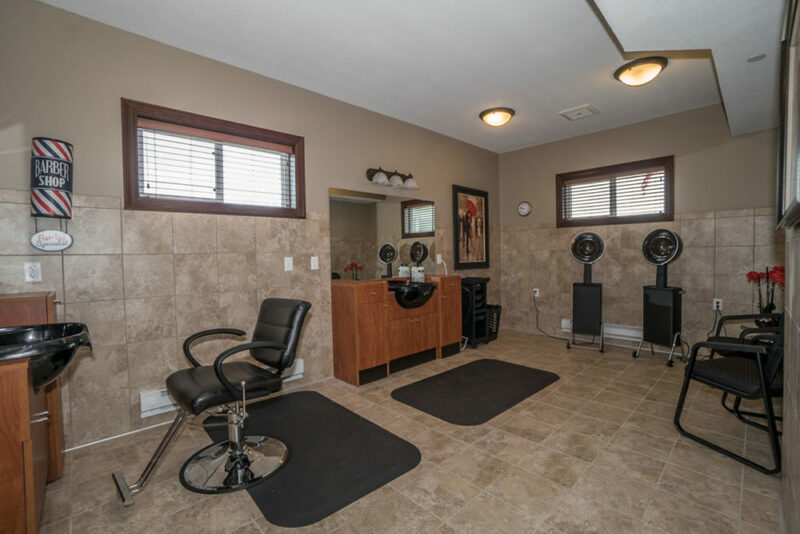 We have a great Landlord – Tenant relationship with Brennan, and are proud to be in one of the finest office buildings and locations in southern Minnesota. Bridge Water is a 24 unit assisted living facility on a half-acre lot in Janesville. It is designed using the greenhouse method where each floor is self-sufficient. The floor, called a house, has its own kitchen, living room and porch. 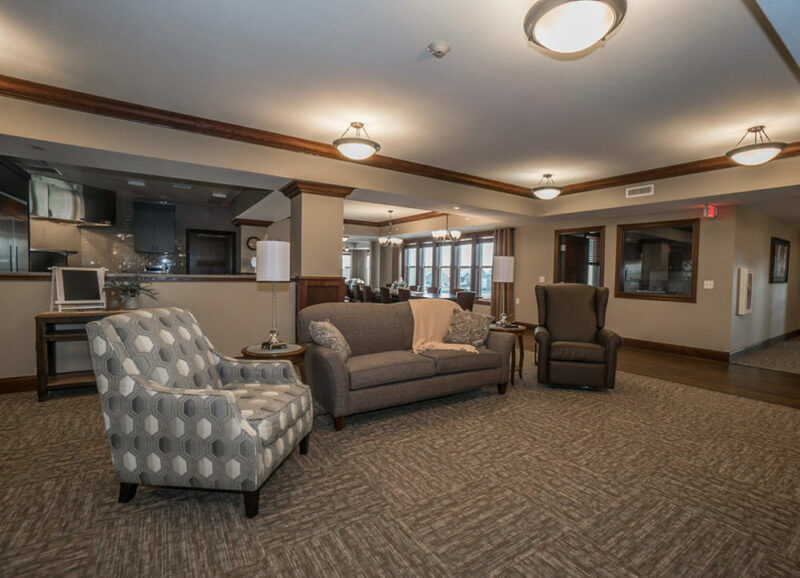 The greenhouse style floor plan and security enhancements keep its memory care residents safe. The fenced in outdoor patio and guest parking allow for families and friends to visit frequently. 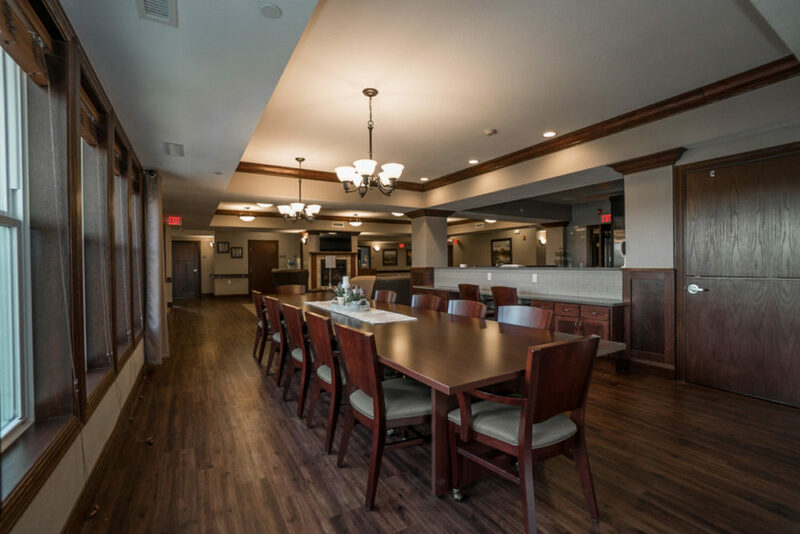 Bridge Water is one of a series of assisted living facilities that will help accommodate the high volume of aging baby boomers that need care. 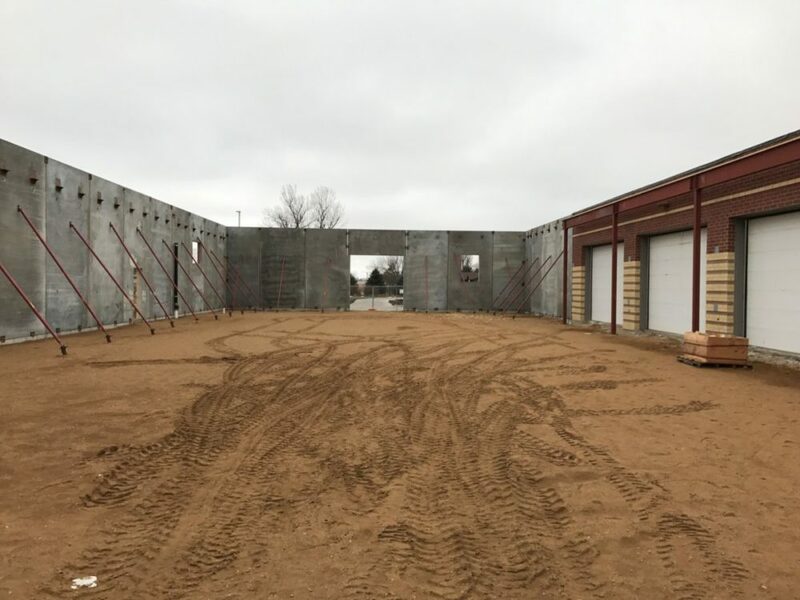 This garage addition consists of a 10,064 square foot precast addition to the current Law Enforcement garage for the Nobles County Justice Center. The garage will house emergency and law enforcement vehicles for the growing Nobles County.